As part of your central heating system, boilers play the most important role—providing space heating and hot water. Since they are pivotal to your heating, choosing a boiler is not just about the type or size, but also about knowing how they work. This page will give you the information you need to understand how central heating boilers work. 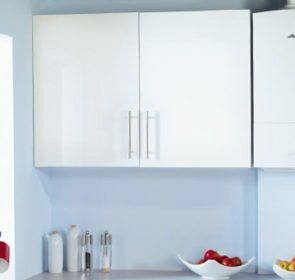 Choosing which boiler to install in your home is a difficult choice. With so many brands and models available, you might be feeling a bit lost. Luckily, one way to help narrow down your options is to look at price. By having a general idea of the costs for various central heating boiler projects, you will be able to hone in on the right boiler for you. We have compiled a handy table of average prices of boilers by type. Feeling lost in your search for information about central heating boilers and installation? Then don’t worry since there are reliable heating engineers with the right qualifications, knowledge, and skills for the job! Find someone using our easy online form. You will receive up to 5 quotations from local, trusted companies so you will be able to easily compare their services and prices—save up to 40% on your central heating boiler now! Choosing a boiler for your central heating is a large investment. To make the right choice, you should have a good understanding of how they work. Whether powered by gas, oil, or electricity, boilers work in a similar way. The fuel enters a combustion chamber, which is then ignited. This energy caused by the ignition is transferred to a heat exchanger, which runs alongside a pipe or chamber holding cold water. The energy from the ignited fuel heats the water. Depending on your heating system, the hot water is used in different ways. If you have a combi boiler, that water is pumped to other parts of your house immediately. For conventional and system boilers, the hot water travels to a dedicated cylinder for storage. When you need to heat your home, the hot water is pumped to various radiators located throughout the property. Once it passes through the radiator, the heat has been transferred to the surrounding room, and this cold water is then pumped back to the boiler. Alternatively, it is sent to water outlets in your house when needed. In most cases, these are bathroom and kitchen taps, and shower. Since 2005, all new boilers must be of the condensing type. In rare circumstances, exceptions may apply and this requirement can be waived. Condensing boilers are not considered a dedicated boiler type. The 3 types (combi, conventional, and system) can all be either condensing or non-condensing. In condensing boilers, there are either much larger or additional heat exchangers to extract more heat from flue gases, achieving higher efficiency rates. In non-condensing boilers, these flue gases would have been lost to the atmosphere. These flue gases can produce cool water vapour, resulting in condensation (that’s where the name comes from!) and is taken away in a condensate pipe. Due to condensation, these boilers should be kept away from windows, cold surfaces, and corners susceptible to moisture. Since the excess flue gas is recycled, condensing boilers achieves efficiency rates greater than 90%. As such, government regulations stipulate that new boiler purchases must be condensing boilers to capture these energy savings. When looking at your options for heating your home, there are 3 types available. 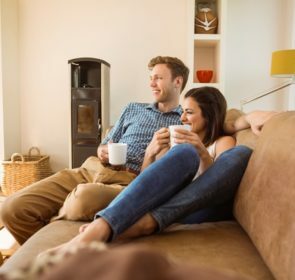 You probably want a central heating boiler that ticks all of your boxes: efficient, reasonable price, practical, and effective. 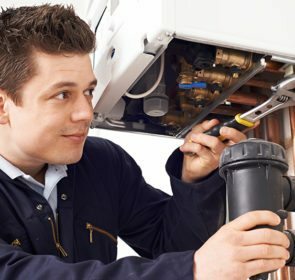 Each type of boiler has its own pros and cons, and so it really depends on your specific situation. Take a look at the details of these 3 boiler types below. Conventional boilers are used in homes with traditional heating systems. These boilers heat water by burning gas or oil, or using electric resistance coils. The hot water is pumped to a hot water cylinder to be stored for later use. This type also requires a cold water storage tank and an additional tank to keep water levels throughout the system at a consistent level. System boilers are similar to conventional types as they use a hot water storage tank. However, they take water from your mains connection, meaning a cold water store is not necessary. Also, many of the components are integrated into the boiler itself, saving space and making installation easier. Combi boilers are the most recent kind to emerge. They have also become very popular due to their numerous advantages. Combi boilers heat water coming directly from the mains on demand. This means they start heating water as soon as you turn on a tap. There is no need for hot or cold water storage tanks. 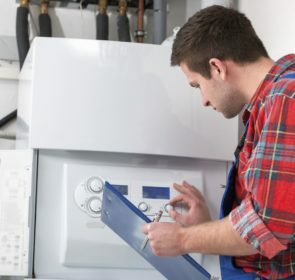 Since the boiler is essential for your heating system, you need to consider all options carefully when shopping around. Your best bet is to research as much as you can and ask the advice of trusted heating engineers. Complete our free, non-binding quote request form to get in touch with companies in your area. They will be able to advise you on your central heating boiler and you will quickly identify the best deal for you!